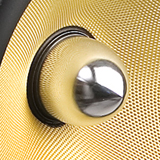 Even at higher crossover settings (over 80Hz) the subwoofer can remain relatively “hidden”, being more difficult to localize than its more traditional, front firing “brothers”. Furthermore, it allows for a more uniform LFE dispersion. The high quality electronics that compose the 120W amplifier, ensure plentiful impact with control as well as immediate, fast transients with every sonic material. The light but rigid, specially treated paper cone couples with the carefully engineered electronics to offer deep bass with extended dynamics. What is an often overlooked link in an entertainment system? The right selection and use of interconnects and cables. An often overlooked yet important link in a home entertainment system are the interconnects and cables. The right selection and use of interconnects and cables brings out the best performance from any system, while the converse can be a real handicap to your systemâ€™s performance. What is the correct way to connect a subwoofer to my system? Through an RCA analog audio interconnect. Most, in not all, of modern subwoofers are active. That means that they are connected to the receiver with an RCA analog audio interconnect. This is connected to the subwoofer output of the receiver which is basically a pre-amp out signal. In order to enjoy deep bass sound without any hum picked up by the mains (50Hz or 60Hz) or EMI and RFI from the environment, you should pick the best balanced interconnect you can afford. This type of interconnect rejects the common noise between the two cables used to carry the signal, while the outer braid acts as an additional shielding to the cable. Furthermore, a sturdy RCA plug should be used to ensure proper connectivity that does not loosen or corrode with time. A locking gold-plated connector is the best choice. How do we hookup speakers? Amplifier to speaker hookup is accomplished with good quality speaker wire. Basic speaker hookup is very simple. Speakers require a connection to an amplifier. The amplifier might be a separate component, or it might be built into a receiver or integrated amplifier. All amplifiers have output terminals. For each channel there will be a positive (red) and a negative (black) terminal. A stereo amplifier will have a left and right set of outputs. It may also have a second set often labeled "B". The "B" output can be used to drive a second set of speakers, for example, extension speakers in the kitchen. Amplifier to speaker hookup is accomplished with good quality speaker wire. Most important: Make sure that you connect amplifier positive to positive at the speaker and amplifier negative to negative at the speaker. If you are wiring a five or seven channel home-theater system, the principles are exactly the same. 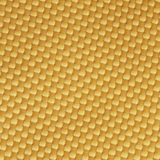 If the speakers are connected out of phase, you will notice a distinct “gap” in the sonic image. When you have more than one speaker, the speakers interact with each other to create a sound field. Sound designers/mixers have the ability to place sounds in various locations within the sound field since they understand the relationship between each speaker. In order for your speakers to faithfully reproduce the sound field, they must all be wired the same way (or in-phase). All negative (-) outputs from the receiver should be connected to the same color (-) input post on each speaker and all positive (+) outputs should be connected to the same color (+) input post on each speaker. If your speakers are out-of-phase with each other, the overall sound will lack the focus and fullness that in-phase speakers reproduce, and you will not hear what the sound designer/mixer intended. Even if only one speaker is wired incorrectly, the sound image will not be correct. After we connect our speakers, we are ready to check that the polarity of the connections is correct. If we can not manually check each cable to make sure that the connection is correct, we use an input signal of white noise to be reproduced by the speakers. If the polarity is wrong the reproduced sound will not be focused between the speakers, there will be a distinct hole in the image and a lack of bass. We then need to change the polarity on one of the speakers so that the speakers are in phase. Do both speaker cables need to be the same length? Yes, it is best if the cables have approximately the same length. If the two speaker cables are not close to each other in DC resistance, and inductance, the damping will be different, and the high frequency roll-off will be different. These kinds of things can affect the stereo image and image depth, as the two channels delicate balance has been disrupted. We recommend against any differences in length for shorter lengths of more than a 2-to-1 ratio and preferably the closer to the same, the better. Long runs will be more critical, and would need a closer match still. What is the classic way to connect an audio device to an amplifier? Through the analogue or digital inputs. The analog inputs and outputs are the classic way to connecting an audio source with the amplifier. We use analog interconnections for the connection of any component (iPods, mp3 players, laptops, turntables, TVs, VCRs, satellite decoders etc.) which does not have a digital audio output. However most modern devices offer digital outputs (SPDIF, Optical Toslink or HDMI) for the stereo or multichannel content. In this way, using a quality Digital Coaxial cable, or Toslink Optic fiber or ultimately a version 1.3b Category 2 HDMI cable, you can easily connect audio devices to your receiver without losing any of the quality. Most receivers nowadays decode all audio formats (be it the classis compressed ones, or the latest uncompressed high def Dolby TrueHD and DTS-HD Master Audio), so they can handle the signal processing from the digital field way to the amplified analog end where the speakers are powered. What are the types and advantages of digital connections? Digital connections include coaxial and optical, for minimal signal noise and distortion. 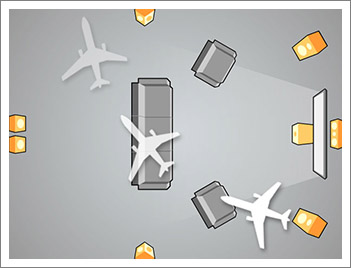 Almost all today's audio/video devices offer a variety of digital connections for the transfer of signal in between them. Digital connections' main advantage is the fact that they are very immune to noise since what really matters is that the source knows if it has received an 1 or 0. After that the signal is reconstructed and fed to DACs (Digital to Analog Converters) so that it is exactly in the form it was produced in the source, without any added noise or distortion. HDMI (High Definition Multimedia Interface): The most modern connection that permits to experience the most lifelike picture and sound from today's highest performance displays and sound sources. It carries uncompressed digital data and can interconnect pretty much everything! Blu-ray disc players, PCs, set-top boxes, video game consoles, TVs and A/V receivers. HDMI supports up to 8 channels of audio at sample sizes of 16-bit, 20-bit, and 24-bit, with sample rates of 32 kHz, 44.1 kHz, 48 kHz, 88.2 kHz, 96 kHz, 176.4 kHz, and 192 kHz. It supports Dolby Digital and DTS, and up to 8 channels of one-bit DSD audio (used on SACDs). Finally with the version 1.3, HDMI supports lossless compressed audio streams Dolby TrueHD and DTS-HD Master Audio. It also features auto lip-sync (from version 1.3) and certainly caters for video signal transmission above 1080p to 1440p, Deep Color, x.v.Color etc. To make the long story short, it's the best available connection! What is all this fuss about different HDMI versions? Download the HDMI Specifications table (link herebelow). Download the HDMI Specifications table <~FilesVIDEO_AUDIO_HDMI_Guide_(EN).xls> to find out the different features that are supported by each version and category of the HDMI protocol. How to connect my Blu-ray / DVD to my receiver? The best way is through an HDMI cable. The best way to connect your Blu-ray / DVD to your receiver is by using an HDMI cable. In this way, high definition audio and high-definition video are sent to the receiver, which keeps, processes, amplifies and outputs to the speakers the audio information, while sending the video information to the HDMI out, which should be connected to your TV. This type of connection renders the receiver the controlling point of all the Home Theater system, as by changing the Source setting, both the audio and video are simultaneously selected (for the Blu-ray or DVD source). In case your receiver does not decode the high definition audio formats (Dolby TrueHD & DTS-HD Master Audio) you need to let the player do the decoding and instead use high quality audio interconnects (one cable per channel) to transfer the decoded and converted to analog signal, to the receiver. Note that high definition audio is not transfered by Coaxial and Toslink connections due to the very big bit rate that is required. Instead if you connect the Blu-ray using this type of connections, you will only hear the traditional Dolby Digital and DTS compressed audio. As for your DVD, if it doesn't feature HDMI, use Coaxial or Toslink to hook it up to your receiver (which in turns does the decoding of the Dolby Digital or DTS stream). What is bi-wiring and bi-amplifying? It is a connection that ensures the independent feed of high and low frequencies to the speakers. Many speakers, including many Crystal Audio speakers, feature separate binding post pairs for the Tweeter and the Woofer(s). These separate pairs, feeding different crossover parts, isolate the high and the low frequency path of the signal fed to the speakers, Bi-wiring consists in the use of two pairs of speaker cable to connect the two binding post pais to the same output connectors of your amplifier, while bi-amplifying consists of the use of separate amplifier stages to power the high and low frequency sections of the speaker. It is rather questionable whether bi-wiring offers a noticeable improvement to the performance of the speaker (other than the increase of the gauge of the cable which in turn reduces losses). Theoretically, it reduces the interaction between the Tweeter and Woofer(s) and improves sound quality.However bi-amping a speakers results in considerable lower intermodulation distortion as a different stage is used for the amplification of the highs and the lows. It is more costly solution but it trully separates the path of high and low frequencies, providing a great clarity to the sound. 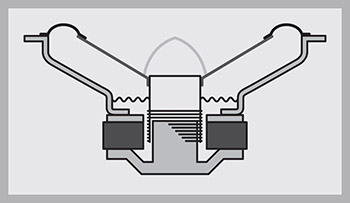 Note that in order for both bi-amping and bi-wiring to be effective, you should remove the connecting terminals (bridges) that exist between the two binding post pairs of the speakers. What is a balanced connection? An analogue connection with conductors for the signal, the inverted phase and the ground. An analog connection found in hi-end equipment, which requires three conductors, one for the signal, one for the signal with inverted phase and one for the ground. 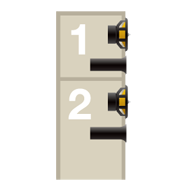 Balanced connections use three-conductor connectors, usually the XLR or TRS jack plug. The term "balanced" comes from the method of connecting each wire to identical impedances at source and load. This means that much of the electromagnetic interference will induce an equal noise voltage in each wire. Since the amplifier at the far end measures the difference in voltage between the two signal lines, noise that is identical on both wires is rejected. The noise received in the second, inverted line is applied against the first, upright signal, and cancels it out when the two signals are subtracted. 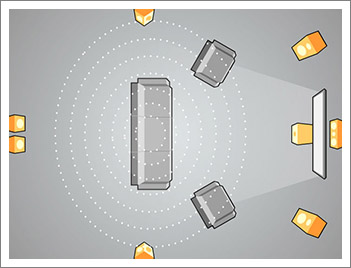 Balanced connections should absolutely be prefered for the Subwoofer, which is prone to low frequency noise that results in an audible hum. How can I choose the best Receiver (amplifier) for me? Which is the best-suited amplifier power for my loudspeakers? 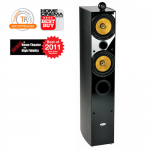 All of Crystal Acoustics’ loudspeakers declare their "recommended amplifier power" spec. 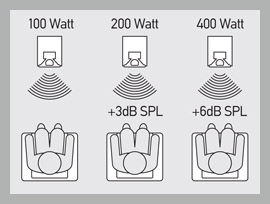 Amplifier and loudspeaker power ratings are specified differently. For amplifiers, the output power is specified on the basis of an undistorted continuous sine signal; for loudspeakers, the (long-term) power handling is specified on the basis of a noise signal shaped in accordance with the standard frequency distribution of a music signal. The respective peak values are twice as high with sine signals, but at least four times as high with noise signals. Over a short period of time Crystal Audio loudspeakers can handle levels distinctly above the norm power specification. Amplifiers, however, can supply only a little more than their nominal power even over a fairly short period of time, after which clipping will set in. Amplifier power and loudspeaker power handling thus cannot be related exactly. To define a reasonable speaker/amplifier combination, all Crystal Audio loudspeakers are specified with a "recommended amplifier power". The lower value marks the minimum amplifier power for achieving slightly more than moderate volume levels under typical listening conditions. The upper value guarantees that even at the highest volume levels that are suitable for the loudspeaker, the amplifier signal will be clipped only rarely. However, due to the varying nature of audio signals, these are only general suggestions to be adjusted according to your system. You should opt for the most powerful amplifier you can afford, based on your needs. Crystal Audio does not recommend any particular brand of amplifiers. The choice of an amplifier is a personal matter dependent on taste, power handling, how many speakers are being used, what type of features you need and of course what your budget is. However, we can give a few hints on what to look for when selecting your Amplifier/Receiver. 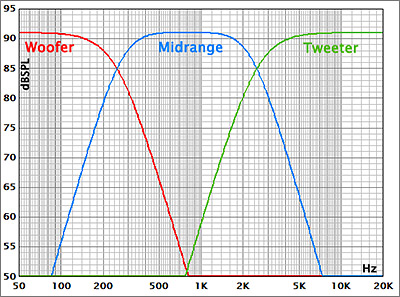 Speaker Amplifier requirement figures (Watts) are intended only as a guide. As a rule, buy the most powerful amplifier that you can afford within the specified range and use it with great care. It is easier to damage the loudspeaker with a small amplifier driven into distortion using too much volume with bass and treble boost, than with a large amplifier, which has plenty of power in reserve. In addition, check whether the receiver offers Auto-Calibration (it is strongly suggested for inexperienced Home Theatre users). In addition, can it decode today's high definition audio formats (Dolby TrueHD, DTS-HD Master Audio, etc. ), and does it support HDMI connectivity and offer upscaling for video signals? We recommend that you discuss with your local specialist hi-fi dealer what they would recommend as they have firsthand knowledge of what systems work best with room layouts, sizes and shapes. What happens if the amplifier power rating is less than the power handling of the speaker? There is a chance that you may cause severe damage to the speakers. If the amplifierâ€™s power rating is below that of the speaker, the amplifier will try too hard to keep up with the speaker, which means that here is danger that the amplifier will "clip" which could possibly cause damage to the tweeters or destroy the speakers. Is it advisable to buy a receiver (multi-channel amplifier) even for a stereo configuration? Yes it is! The added benefit is that you can upgrade your system any time! Yes it is! 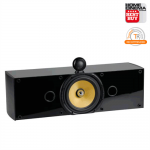 If you use modern, stylish and compact speakers for the Left and Right channels, then you most probably need a Subwoofer to add the bass frequency extension needed to get a realistic music reproduction. Classic stereo amplifiers do not support the connection of a subwoofer, while modern receivers offer a subwoofer output, plus electronic crossovers for the proper bass management. Set the crossover frequency to 80Hz (if your main speakers are able to reproduce those frequencies) and set the levels of main speakers and sub, so that the result is balanced. However, note that it is not only about having small speakers. Even if your speakers can reproduce low frequencies, the bass management can only be optimum if you can isolate them and place the speaker reproducing them (here comes the Sub!) in the best position according to room acoustics (where the standing waves are less prominent so that the low frequencies sound field is smooth). Otherwise, you will be obliged to keep the low frequencies tied to the main speakers, whose position is strictly specified and not flexible like the subwoofer's. Apart from that, you get a mult-ichannel receiver and have the added bonus of being able to upgrade to a 5.1 or 7.1 system at any time you wish. It means Digital Signal Processing. The letters DSP stand for Digital Signal Processing. The signal is the information that is picked up from the Blu-ray, DVD or CD, flows through the system, and eventually emerges as music or movie soundtrack. Signal processing refers to just about everything your sound system does to your signal -- anything from raising it from a preamp to an audible level, to boosting or cutting bass and treble, all the way to making your living room sound like a stadium or a movie theatre. Digital Signal Processing performs that type of signal manipulation in the digital domain. That is, it deals with your signal not as a continuous stream but as a series of "zeros and ones". 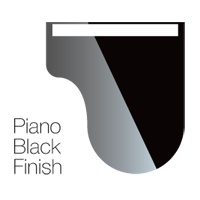 DSPâ€™s most common applications used to be the re-creation of various acoustic environments in our living room, so we can listen to Miles Davis play in a "jazz club" and the Benedictine Monks chant in a "cathedral". Nowadays, more sophisticated DSPs decode the multichannel high definition formats and calibrate automatically your speakers' response so that their in-room performance is balanced. Why does my AV Receiver decoder provide delay adjustment? 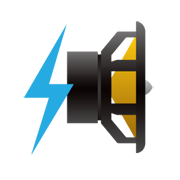 It adjusts the audio delay between different distanced loudspeakers in your setup. 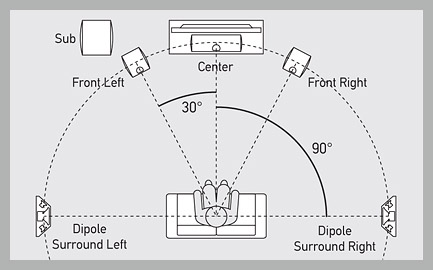 Because the speakers in a home theatre system are all at a different distance to the viewers, multi-channel playback requires a delay of the signal reaching them, in order to virtually align the speakers, so that they are equidistant to the listener. This delay is inserted to the receiver via the distance of each speaker from the main listening position. Note that this is mostly done automatically in modern Auto-Calibration receivers, using their calibration microphone. By inserting the correct delay times needed, the carefully created sound stage is accurately rendered. What does the Auto-Calibration function of my receiver do and how does it affect of my speakers? After completing the process, levels and distances of speakers are spot-on. Most modern receivers feature an Auto-Calibration function (be it Audyssey technology on Denon and Onkyo designs, Sony's Digital Cinema Auto Calibration, Pioneer's Multi Channel Acoustic Calibration or Yamaha's Parametric Room Acoustic Optimizer). 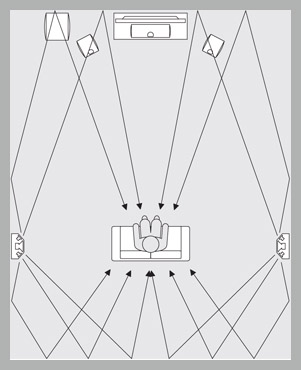 Basically you set a microphone (provided with the receiver) where one of the ears of the main listener would be and the receiver outputs a series of signals (mostly noise bursts) to all of your speakers, setting their levels, distance from listener, confirms their correct phase and finally tries to correct through equalization either the non-flat response of speakers themselves or the combined effect of room acoustics with your speakers that results in uneven response. 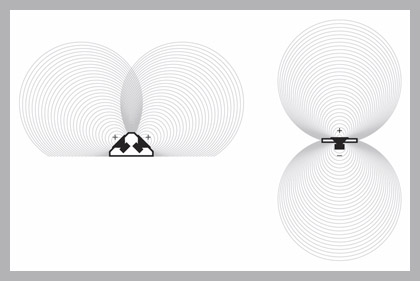 The series of tests from the receiver may be repeated for more microphone positions, depending on the Auto-Calibration algorithm implementation, resulting in more uniform reproduction across a wider area as opposed to a confined sweet spot. Most probably, the levels and distances of speakers are spot-on after the Auto-Calibration is finished. However, check to see that the figures seem reasonable. As for the frequency correction performed through EQ, do not always assume that it gives a better result. Be sure to listen your system using your favourite music and movies and turn the Auto-Calibration EQ on and off periodically to see what sounds best to your ears. If on the other hand you are an experienced Home Theatre user, really striving for the best result, you can fine tune the EQ settings using your ears (NOT advised!) or a SPL-meter together with a DVD that provides band filtered noise, enabling you to measure the SPL produced by your speakers for some split bands of the 20Hz-20kHz spectrum. What are the technical characteristics of an amplifier that can drive low impedance speakers? It must be able to transform PCM to PWM and amplify them effectively in the digital domain. The size of the capacitors and the transformer utilized in the power supply section and the implementation of the amplified stages determines the capability of the amplifier to drive low impedance speakers. The most critical factor is the amplifier capability to increase the output current that it can supply to the speakers. Amplifiers with carefully implemented power supplies, large transformers and capacitors, do not run out of the power required to deliver the sound accurately. If the amplifier cannot supply the required current, then the sound of the system will be inferior and could even damage the speakers. 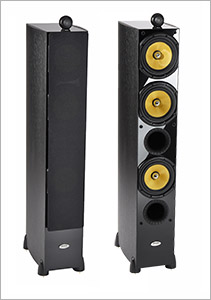 Weak bass, reduced dynamics and harsh highs characterize the sound of a system whose amplifier is not up to the task. Especially dangerous for the speakers is the occurrence of "clipping". In general, all semiconductor amplifiers can drive any speaker as long as it is not clipping. Today's receivers, on the other hand, offer protection so that they don't result in clipping even if the connected speakers have quite a low impedance. Amplifiers made of capacitors, transformers and amplifier stages. The audio sources of home entertainment systems are becoming increasingly digitally based. This has increased the popularity of digital power amplifiers. There are two methods for engineering a digital amplifier: true digital power amplifiers and power amplifiers which incorporate digital technology. The latter type accepts a digital signal at its input which is then converted to an analogue signal by its integrated Digital to Analogue (D/A) converters, and is amplified in the traditional analogue way. As for the first type (a true digital amplifier or class D design), they transform the incoming PCM (pulse code modulation) audio signal, into another digital format called PWM (Pulse Width Modulation), which is then amplified in the digital domain. The PWM amplification stage is a type of switching circuit, and is therefore not influenced by nonlinearity and transistor noise. 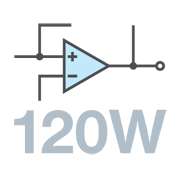 The PWM data switches conventional transistors on and off depending on the length of the data pulse. The signal amplitude depends on how long the transistors are on or off. The on/off output of the transistors represents the audio wave. At the final stage, the PWM amplified signal is lowpass filtered (using a high quality coil-capacitor network), so that only audible frequencies pass through while all the high frequency content is rejected. Should I fill up my living room with cables to enjoy performance Home Theater? What happens if connecting my Surrounds would create a cable clutter? Check out our Wireless Amplifiers! It is true that the Surround speakers are the hardest to be wired. Since your receiver is from the opposite direction (somewhere near the Center speaker) you must have two cables running across your room to feed signal to the rear speakers. Of course your electrical installation may have provided for pre-installed cables inside the walls so your problems end here! 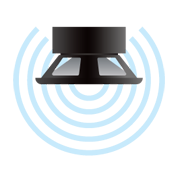 On the other hand if it is really difficult to hook up your Surrounds without causing a mess with cables, you can simply check our Wireless Amplifiers. Simply connect the wireless trasmitter to your amplifiers Surrounds output (high level or pre-amp level) and then just plug the wireless receivers with integrated amplifiers, to an outlet on the wall where your surrounds are, and connect them with small cables to your speakers. It's as simple as that. Go to the Wireless Amplifiers page for more information. 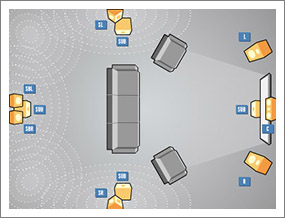 What are the advantages of using Wireless Amplifiers for my Surrounds? You can install the speakers without any cables crossing your room. Obviously you install rear speakers without any cable crossing your room. That alone is a great benefit, ain't it? Apart from that however, the Wireless Amplifiers offer another great advantage. They relieve the burden from your main A/V receiver of powering the rear speakers, thus leaving more power and headroom for the front and center speakers to perform optimally even if their impedance is quite low. And all that without any trade off. The sound delay inserted by the wireless transmission is totally undedected by human ear (around 2ms) and the transmission is totally noise and interference prone free. Are the Crystal Audio Wireless Amplifiers prone to interference from other wireless devices? No, thanks to the advanced filtering circuit. No. The transmission along with the correction algorithms used support an interference free operation, immune to mobile and wireless phones, microwave ovens, wireless computer networks, Bluetooth devices, human body, etc. 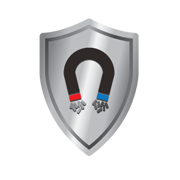 Additionally, the four channel auto-detection and auto-scanning feature ensures that a free band is always selected automatically when you are in a really 'electomagnetically noisy' environment, without you having to worry about changes switches. Can I use the Crystal Audio Wireless Amplifiers to power up other speakers apart from the Surrounds? Surely you can. You can use them to power up a pair of stereo speakers in your balcony or your garden. You can also use the Wireless Amplifiers to connect your iPod or mp3 player or Laptop to feed music to your Hi-Fi speaker pair without any annoying cables lying on the floor. Or you can send music to another room(s) buying some extra Wireless Receivers. The possibilities are really endless! What type of signal transmission is used by the Crystal Audio Wireless Amplifiers? DSSS (Direct-sequence spread spectrum) Wireless Digital Transmission. The Crystal Audio Wireless Amplifiers utilize DSSS (Direct-sequence spread spectrum) Wireless Digital Transmission for Class-leading, Uncompressed CD-quality signal. The band used is the ISM at 2.4 GHz. It supports a data rate up to 4Mbps. It's an interference-free transmission, immune to mobile and wireless phones, microwave ovens, wireless computer networks, Bluetooth devices, human body, etc. What are the mostly used audio formats? What is the difference between Dolby Pro Logic, Dolby Pro Logic II and Dolby Digital? They are different audio processing and discrete signal technologies from Dolby Digital. Dolby Pro Logic is a matrix decoder that decodes the four channels of surround sound from a Dolby Matrix encoded stereo track, such as VHS HiFi tapes, Stereo CDs, etc. Dolby Pro Logic II is an advanced matrix decoder that derives five-channel surround (Left, Center, Right, Left Surround, and Right Surround) from any stereo track. It works on any file even if it hasn't been encoded in the Pro Logic II format. 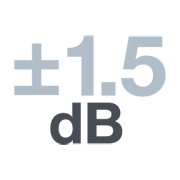 On encoded material such as movie soundtracks, the sound is more like Dolby Digital 5.1 (see below), while on unencoded stereo material such as music CDs the effect is a wider, more involving soundfield. Among other improvements over Pro Logic, Pro Logic II provides two full-range surround channels, as opposed to Pro Logic’s single, limited-bandwidth surround channel. Dolby Digital 5.1 on the other hand is a discrete system that keeps the multiple 5.1 channels fully separated throughout the encoding and decoding processes.5.1-channel soundtracks can be heard on most movies either on DVDs or in theatres. Dolby Digital 5.1 is also being offered through Window Media 9, digital cable, digital broadcast TV (DTV), and satellite transmissions. Dolby Digital needs to be decoded by a Dolby Digital Decoder. It does not use the same Dolby Surround encode/Pro Logic decode process. Though you can listen to Dolby Digital 5.1 Encoded soundtracks in Dolby Pro Logic via the analog outputs on most DVD Players. In addition to having full-range Left, Center, Right, Left Surround, and Right Surround channels, Dolby Digital 5.1 soundtracks carry a sixth (“.1”) channel recorded with low-frequency effects (those bass rumbles and booms you feel as well as hear in a well-equipped cinema). Do all Dolby Digital programs provide 5.1 channels? No, Dolby Digital soundtracks can provide anything from mono to full 5.1-channel surround sound. No, Dolby Digital soundtracks can provide anything from mono to full 5.1-channel surround sound. DVD discs can even carry multiple versions of the soundtrack that differ in the number of channels. 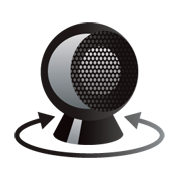 A disc might contain a 5.1-channel sound mix with the dialogue in one language, a Dolby Surround-encoded two-channel mix in another language, and a mono track with the directorsâ€™ comments or other supplementary information. The default soundtrack will vary from disc to disc, so always check the DVD discâ€™s Language menu for the choices offered. DTS (Digital Theater Systems) is the alternative to Dolby Digital when it comes to digital surround sound. Like Dolby Digital, DTS is a discrete digital multichannel audio format.DTS is most often associated with movie soundtracks, but this high-resolution approach to surround sound is also being used to create multichannel versions of music recordings, too. Whether we're talking about a movie theater or a home theater, DTS, like Dolby Digital,is an encode/decode system: to play back a Dolby Digital soundtrack, you need a Dolby Digital decoder, and to play back a DTS soundtrack you need a DTS decoder. An advanced form of digital audio coding for high-quality digital surround sound. Dolby® Digital technology is an advanced form of digital audio coding that makes it possible to store and transmit high-quality digital sound far more efficiently than was previously possible. First used in movie theaters in 1992, Dolby Digital technology is the result of decades spent by Dolby Laboratories developing signal-processing systems that exploit the characteristics of human hearing. 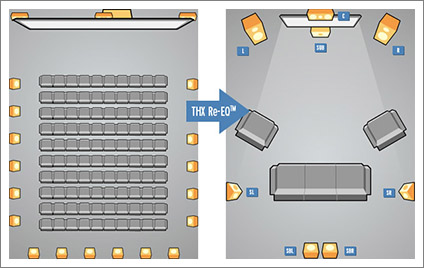 Dolby Digital programs can deliver surround sound with up to five discrete full-range channels: Left, Center, Right, Left Surround, Right Surround-plus a sixth channel for powerful low-frequency effects. 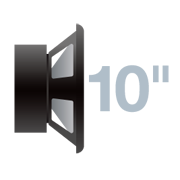 As it needs only about one-tenth the bandwidth of the others, the LFE channel is referred to as a ".1" channel (and sometimes erroneously as the "subwoofer" channel). What are the different types of DTS and Dolby Digital audio formats? Dolby Pro Logic IIx technology lets you take your listening environment to the next level by expanding your two-channel (stereo) or 5.1-channel audio to 6.1- or 7.1-channel playback. Dolby Pro Logic IIx also extends Dolby Pro Logic's sophisticated technology for the smoothest surround sound experience possible. Dolby Pro Logic IIz takes surround to the next level by adding front height channels—an additional pair of speakers positioned above the front left and right speaker. What that means for you is a surround sound experience with incredible depth and dimension. Most surround sound solutions use digital signal processing (DSP) to artificially model listening environments. Expanding on proven Dolby Pro Logic IIx technology, Dolby Pro Logic IIz stands apart by identifying and decoding spatial cues that occur naturally in all content—stereo and 5.1 broadcast, music CDs, DVDs, 5.1- and 7.1-channel Blu-ray Discs, and video games. 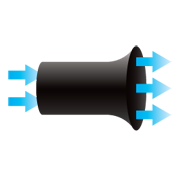 It then processes ambient sound and certain amorphous effects such as rain or wind and directs them to the front height speakers. Dolby Digital Plus gives you access to more content and lets you experience all of the enveloping surround sound that Blu-ray Disc™, high-definition (HD) broadcast, and streamed and downloaded media make possible. Enables up to 7.1 channels of theatre-quality sound, unlocking the full audio potential from Blu-ray Discs, HD broadcast, and streamed and downloaded media. 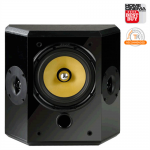 Are Crystal Audio speakers suitable for playback of Dolby TrueHD & DTS-HD Master Audio formats? They are perfectly up to the task! Of course. Not only they are suitable for High Definition audio formats however, but they are indispensable to get the best out of them. These High Definition audio formats simply deliver discreet uncompressed audio, coded using extremely high bit rates, for all the channels of a modern multichannel system. The result is that you can hear (if your system permits it!) all the details that the director and musicians wanted to breath into their creation. These details and depth are perfectly rendered by the Crystal Audio speakers. Bottom line: The new HD audio formats are useless if your speakers are not so good as to reveal their depth! What type of connection is needed to enjoy the new High Definition audio formats? HDMI is the best possible choice offered by current standards. The new High Definition audio formats use extremely high bit rates to transmit the massive amount of data needed to decode the information for all channels of a multichannel system. Thus, conventional connections like the SPDIF/Toslink are rendered pretty useless. Thanks to the HDMI however (note, it must be version 1.3) the connection of HD sources to your A/V receiver is as easy as plugging one cable. Alternatively you can transfer the signal in the analog field, using one, high quality, audio interconnect per channel. The use of a quality HDMI, version 1.3, is highly proposed though. How should my listening room ideally be? 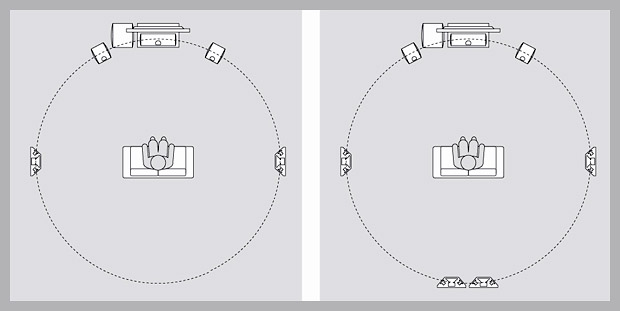 Does the size and shape of my room affect the set up of my surround sound system? 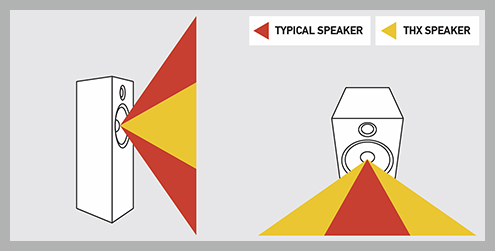 There is a direct correlation between your room’s size, shape and loudspeaker placement. There is a direct correlation between your room's size and shape and the placement of your speakers. 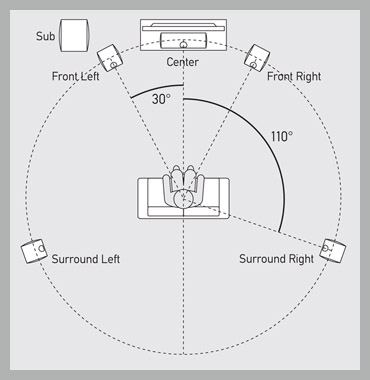 In a "long" room set-up, with the seating located in the middle of the room, it is best to mount the surround speakers on sidewalls parallel to the main seating position. If they were mounted on the rear wall in this room configuration there may be a pronounced "hole" in the sound stage, with sounds "jumping" from front to rear rather than there being a smooth transition. 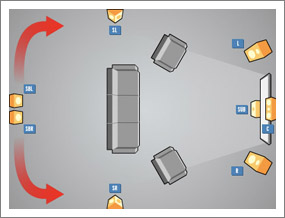 In a "short" room set-up with seating on the rear wall you might get away with speakers being mounted on the rear wall. Furthermore, depending on the distance of the side walls from the listener, you might prefer to use floorstanding speakers as surrounds instead of dipoles. What are the steps for the correct selection of speakers that match your space? Decide which stereo or multichannel system you like best and run our RAD on-line application. Only by selecting the proper speakers for your room you will have high quality sound. Do you need a simple stereo or a modern multichannel system? Keep in mind that modern multichannel home cinema systems are good not only for movie reproduction but also for high quality audio reproduction - SACD (Super Audio CD), DVD-Audio - as well as modern games consoles such as the X-Box and Playstation. You can listen to your favorite albums in a multichannel mix and feel a truly new experience. Once you decide on a stereo or multichannel system (we recommend a modern multichannel system), consult the Crystal Audio Room Acoustics Designer - RAD®, a unique utility which helps you place your Home Theater in the optimum way into your own room. 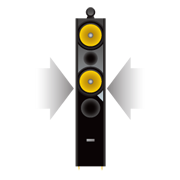 You can choose different types of speakers, according to your preference and room dimensions. At the same time you will be properly consulted for the correct placement of the speakers in the room based on the room dimensions, furniture etc. 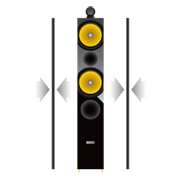 Room Acoustics DesignerÂ® is more than a simple programme that selects loudspeakers based on the input of the user. 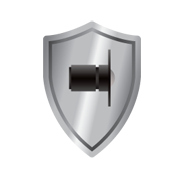 Room Acoustics Designer® is a patented software, accessible free of charge at the Crystal Audio website. 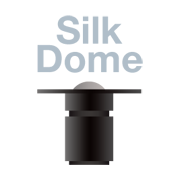 What are the standing waves or room modes? When a wave hits a hard boundary (in our case the wall/floor/ceiling of a room) it is reflected back. The reflected wave adds with the original wave and depending on the ratio of the wavelength to the dimensions of the room, the sum of the two waves creates points in the room where specific frequencies are emphasized and points where they are attenuated. The result from the wave sum is called standing wave, as it does not propagate in space but rather creates a 'standing' field that selectively boosts and attenuates different frequencies. An alternative naming for this phenomenon is room modes, where each mode represent the standing wave that is caused by each separate boundary and affects a specific frequency. In the end of it all the multiple reflections result in different frequencies being boosted or attenuated by a different amount in different places in the same room, all depending on the position of speakers. For typical 'small' domestic listening rooms, low frequencies are the ones affected my this wave effect. Hence the attention we must pay in correctly placing the subwoofer in the room so as to minimize the standing waves. 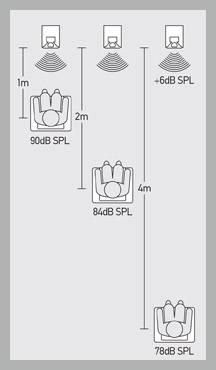 What are the ideal room dimensions for best speaker performance? You must work with the room available to you. Rooms with different height, width and length are preferable for best low frequency performance and for the minimization of resonance problems, but obviously you must work with the room available to you. If possible, place the speakers so they are firing along the longest wall. In other words, if the room is 5 meters wide and 10 meters deep, place them along the 5-meter wall. There will be less wall reflection and therefore a more natural sound. What rules to follow for a home theater room construction? Room shape, reflections, reverberation time and isolation, are key elements you must consider. What are the realistic Sound Levels that you need in your Space? They range up to 194dB SPL! Check the following table. The table that follows indicates the Sound Pressure Levels dB SPL, of various sound sources. It helps you realize yor requirements in sound level. Which combination of Amplifier/Speaker/Room give the dB that you require? The table below indicates the Sound Pressure Level of a pair of speakers with 90 dB/2.83V/m sensitivity and 8Ohm impedance. Note that a stereo pair produces 90 + 3 = 93dB of SPL, that is a 3dB increase (as opposed to +6dB which you would be inclined to think). An audio correction algorithm to counteract the effects of room resonances and standing waves. No matter how careful the design of the home theater room is, there still exist standing waves and speaker/room boundary interactions. In both circumstances a proper equalization can restore accurate spectral and tonal balance. During the 60â€™s and the 70's graphic equalizer use (or shall we say abuse) resulted in highly unsatisfactory sound. Equalizers were used for everything from tone controls to means of forcibly obtaining flat frequency response from grossly inaccurate loudspeakers and in the process lost their appeal with the audiophiles. 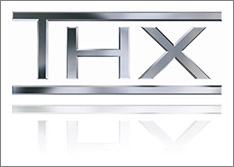 Today, sophisticated algorithms, implemeted by some niche manufacturers, provide corrections both in frequency and the time field (that is they correct the frequency response as well as the phase of the waves) resulting in a much better (although still not perfect) undoing of the effects of the room acoustics. How to place my speakers? Where is the best place for my surround sound speakers? The best placement is between 90° to 110° from each side of your listening position. The best surround speakers are Dipoles. Their role is to offer a wide dispersion of sound in all directions, giving benefits such as a transparent and detailed sound and rear channel effects that are similar to a true cinema experience, created by the rows of side loudspeakers. The best placement of Dipoles are between 90° to 110° to each side and about 70cm or higher above the listener's ears. Please refer to the drawing. All speakers must be broken in for some time. Use your speakers for at least for 100 hours in mid to low listening levels, before they can perform at their best. 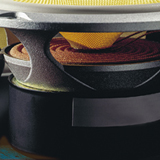 The successful placement and adjustment of a subwoofer is the result of many trials. 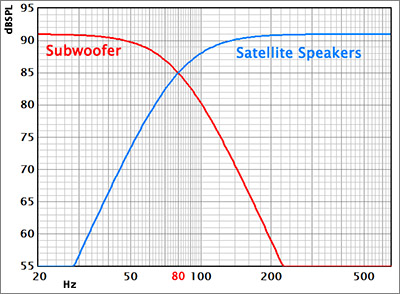 A correctly placed and adjusted subwoofer generates sound that cannot be localized as coming from a separate speaker. Place the subwoofer near the listening position. Play a jazz piece with acoustic bass and many succeeding notes "walking bass". Get down on your knees (beware of your neighbors...) and find the exact point of the room where the bass sounds the clearest. Now change position, place the subwoofer at this spot and sit at your listening position. Avoid placement of the subwoofer equidistant from the two walls. 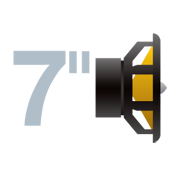 If, for example, the width of the room is 8 m, do not place the subwoofer at the middle of this distance (4 m). 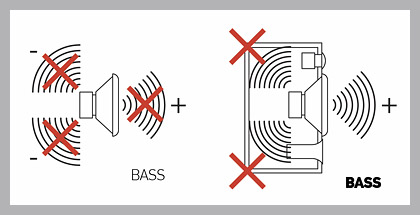 Do not place the subwoofer in the corner and at the same distance from the two corner walls. Place the subwoofer as close to the listening position as possible. This way you will experience more of the direct sound of the subwoofer instead of the reflections of the room. The use of two subwoofers, to the left and to the right of the listening position, is the ideal albeit more expensive solution. The ideal location for the subwoofer may not be practical. Think of the decor of the room and make sure the subwoofers are not in the way. Experiment with various locations based on the above suggestions. You will be rewarded with much better sound without additional cost. 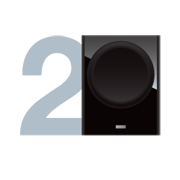 What is the benefit of using two or even four subwoofers? You will enjoy uniform, fully extended low frequencies with minimal to none standing waves. 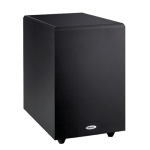 Extensive THX and AES (Audio Engineering Society) research has proven that the use of two and - even better - four subwoofers is the best solution for achieving a uniform bass performance for many seats around the listening area. 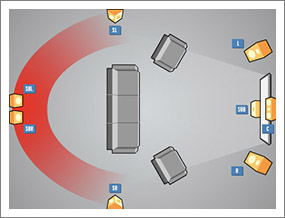 Each subwoofer creates its own modes, which overlap randomly with the modes of the other subwoofers in the room. Statistically, this results in a more uniform result, with the big dips and peaks in the low frequency response being mitigated considerably. For the ones craving the most realistic LFE experience, the extra cost is definitely worth the effort!